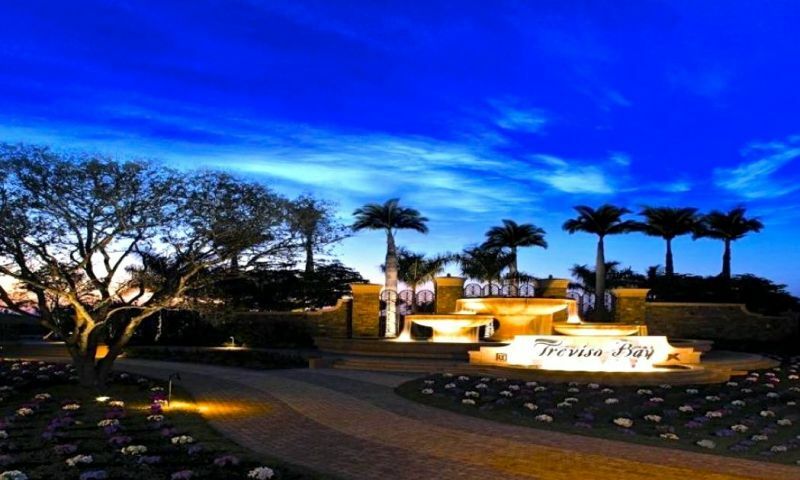 Treviso Bay is a luxury resort-style golf community located in Naples, Florida. This active lifestyle community boasts excellent amenities and elegant homes in a beautiful setting. Residents in the community enjoy endless options to stay socially and physically active. The surrounding area offers homeowners numerous choices for entertainment and culture as well as a convenient location near the scenic Gulf Coast area. The amenities offered at Treviso Bay are second to none. Rilassare is the 15,000 square-foot sports complex that offers all of the physical activities for residents. They can enjoy working out in the state-of-the-art fitness center or aerobics studio, get pampered at the beauty salon or relax with a massage in the full service day spa. The lounge is a great place to hang out or meet up neighbors before heading outside to explore the other amenities. Outdoor amenities are superb as well. Residents can swim in the resort-style pool or adult lap pool. They can relax on the outdoor patio or grab a bite to eat at the poolside cafe and bar. Afterwards residents can meditate on the yoga lawn or read a good book at the beach area under a shaded cabana. A 50,000 square-foot clubhouse is currently under construction at Treviso Bay. This additional clubhouse will offer amenities such as a card room, ballroom, multi-purpose room, billiards, restaurant, state-of-the-art fitness center, sauna, lounge, and golf pro shop. Those with a competitive side will enjoy the eight lighted Har-Tru tennis courts, two bocce ball courts, a pickleball court, and half basketball court. At the center of the community is the 18-Hole TPC Treviso Bay championship golf course. This beautifully maintained golf course was designed by Arthur Hills and is playable for all skill levels. Treviso Bay is the only community in the world that offers an unlimited TPC golf course membership for its homeowners. Treviso Bay started in 2008 and is slated to have 1,300 residences at completion. Homebuyers can choose from a variety of great floor plans offered by multiple builders such as Lennar, Stock Construction, or Taylor Morrison. These builders all offer great low-maintenance models with functional floor plans and modern designs. Lennar offers condos, attached homes, and single-family homes. The Terrance Condominiums range between 1,194 and 1,408 square feet of living space and offer at least two bedrooms, two bathrooms, and a covered parking spot. These condos have open floor plans and provide the best in low-maintenance living, perfect for active adults. The Verandas offer 1,355 to 1,661 square feet with two bedrooms plus a den, two bathrooms, and a detached one-car garage. These two level buildings have six units per building with eat-in kitchens and a covered lanai perfect for relaxing. The Coach Homes are attached residences that range between 1,883 to 2,099 square feet. Each model has three bedrooms, two bathrooms, and a two or three-car garage. Those looking for a little more living space can choose between three single-family home collections built by Lennar. The Executive Homes offer between 1,649 and 2,246 square feet of living space. Each home has two to four bedrooms, two to three bathrooms, and an attached two-car garage. Open floor plans and over-sized master suites are just some of the great features in this collection. Manor Homes offer between 2,245 and 2,268 square feet with three to four bedrooms, two or three bathrooms, and an attached three-car garage. Classic Homes offer the largest homes by Lennar with 2,394 and 3,659 square feet of living space. These beautifully designed floor plans offer three to four bedrooms, two-and-a-half to four bathrooms with an attached three-car garage. The optional outdoor kitchen area on the lanai offers an excellent place to entertain family and friends. Taylor Morrison built single-family homes in Treviso Bay. With three models ranging between 2,868 and 3,213 square feet of living space, each home has three bedrooms, three-and-a-half bathrooms, and an attached two-car garage. These homes have inviting designs with low-maintenance exteriors. These homes are available on a resale-only basis. Stock Construction offers the largest luxury single-family homes in Treviso Bay. Each model was designed with modern floor plans and great low-maintenance exteriors. Ranging in size from 3,255 to 4,239 square feet of living space, each model has three to five bedrooms, three-and-a-half to five bathrooms, and an attached three-car garage. Eat-in kitchens and dens are included in each home and most homes have scenic water or preserve views. Residents of Treviso Bay enjoy a socially active lifestyle. Residents can play tennis, golf, bocce ball, basketball, or pickleball or start a league or club on their own. An activities director plans numerous clubs and activities to fit the interests and hobbies of all the residents. An annual homeowners' association (HOA) fee covers the maintenance of the community grounds and the lawn care of all the homes in the community. This leaves residents with more time to enjoy all the great amenities at Treviso Bay. Treviso Bay is located in Naples, Florida just off Tamiami Trail East. Residents enjoy the areas' never ending options for entertainment. With close proximity to I-75 travel to other parts of Florida is a breeze. Fort Myers is about an hour north of Treviso Bay and offers a great day trip destination. Sports lovers will enjoy the professional sports teams including the Tampa Bay Rays baseball team and the Tampa Bay Lighting hockey team. Nature lovers and photographers will appreciate the scenic wildlife preserves in the area. Just miles from beautiful Gulf Coast beaches residents of Treviso Bay enjoy a tropical climate all year. Homeowners can enjoy living in a resort-style community with great golf privileges at Treviso Bay in Naples, Florida. Rilassare - 15,000 Sq. Ft. There are plenty of activities available in Treviso Bay. Here is a sample of some of the clubs, activities and classes offered here. The Terrance Condominiums are four-story buildings. Units range between 1,194 and 1,408 square feet of living space and offer two bedrooms, two bathrooms, and a covered parking spot. These condos have open floor plans and provide the best in low-maintenance living. Verandas offer from 1,355 to 1,661 square feet of living space. They have two bedrooms plus a den, two bathrooms, and a detached one-car garage. These two-level buildings have six units per building with eat-in kitchens and a covered lanai perfect for relaxing. The Coach Homes range from 1,883 to 2,099 square feet of living space. Each model has three bedrooms, two bathrooms, and a detached two or three-car garage. The Coach Homes provide a little more square footage than the Verandas with the same low-maintenance living. The Executive Homes offer between 1,649 and 2,246 square feet of living space. With at least two bedrooms, two bathrooms, and an attached two-car garage; these models were designed for active adults. Open floor plans and over sized master suites are just some of the great features in this collection. Manor Homes offer 2,245 and 2,268 square feet of living space. These single-family homes have three to four bedrooms, two or three bathrooms, and an attached three-car garage. Manor Homes feature spacious floor plans with lanais, gourmet kitchens with a nook, dining rooms. The Classic Homes offer the largest homes by Lennar. These models range between 2,394 and 3,659 square feet of living space. These beautifully designed floor plans offer at least three bedrooms, two-and-a-half bathrooms with an attached three-car garage. The optional outdoor kitchen area on the lanai offers an excellent place to entertain family and friends. Please Note: Not all floor plans are available at this time. Taylor Morrison built single-family homes in Treviso Bay. With three models ranging between 2,868 and 3,213 square feet of living space each home has at least three bedrooms, three-and-a-half bathrooms, and an attached two-car garage. These homes have inviting designs with low-maintnance exteriors. These homes are available on a resale-only basis. Stock Development offers luxury single-family homes. Ranging in size from 3,255 to 4,224 square feet of living space, each model has two to five bedrooms, two-and-a-half to four-and-a-half bathrooms, and an attached three or four-car garage. Eat-in kitchens and dens are included in each home. Most homes have scenic water or preserve views. Please Note: Not all floor plans are available at this time. Wow this is going to be an amazing community. We currently live nearby at Lely Resort and although it's a great community, we're interested in something smaller and even nicer! Treviso is brand new but the entrance and landscaping already done is outstanding. The golf course is also fantastic. The clubhouse is under construction and I can not wait to see it finished. I know it will be spectacular! 55places.com is not affiliated with the developer(s) or homeowners association of Treviso Bay. The information you submit is distributed to a 55places.com Partner Agent, who is a licensed real estate agent. The information regarding Treviso Bay has not been verified or approved by the developer or homeowners association. Please verify all information prior to purchasing. 55places.com is not responsible for any errors regarding the information displayed on this website.